For GPS address use 3010 Elizabethtown Road, Hershey, PA 17033. Family Fun with Outdoor Laser Tag, Go-Karts, Miniature Golf, Bumper Boats, Batting Cages, Escape Room and a Golf Driving Range. Birthday Party packages and Group rates available. Open year round (see website for seasonal hours). Space Notes: We can accommodate groups from 20 - 350! Build camaraderie with friendly competition; with built-in squirt guns you can soak your supervisor on the bumper boats, compete with co-workers for first place on the go-karts, show off your putting skills on the mini golf course, or hit a home run in the batting cages. Private corporate event parties can be arranged for groups of 50 - 350 during the pre- and post-season. Call us today as the calendar fills up early in the year! Description: Call ahead to arrange the use of our pavilion, which accommodates up to 140 guests. If you operate a motor coach business, Adventure Sports in Hershey is a great choice for a planned stop whether on your way to or from other Hershey and Harrisburg attractions. Stop for an ice cream or a quick refreshment, or spend a few fun filled hours at mini golf, swinging in the batting cages, racing in the go-karts, or cooling off in the bumper boats. 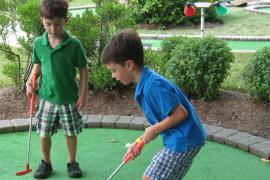 *Buy 1 mini golf game at regular price, get 2nd mini golf game free.